How does the universe work, and how can you make it work for you? This is the question unpacked in this succinct book about manifesting, written by Michael Murphy, co-founder of the Esalen Institute (1962) and a key catalyst in the modern human potential movement. The book’s first half summarizes key scientific and spiritual principles that “legitimize” our claim to creative power — the foundational principle being that we attract into our life what we think about. 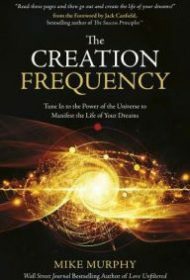 Hence, the importance of raising our “creation frequency,” the “sweet spot where we are ‘in tune’ with life.” The second half shares “the practical instructions for walking through the process to manifest your heart’s desires” that Murphy received 30 years ago from a “mystery man.” The five steps are: 1) finding out what you really want; 2) writing your intentions; 3) creating your “transmitter”; 4) listening with your subconscious; and 5) letting go and trusting. While the message is widely known by now, it is enriched with familiar insights gleaned from renowned teachers (such as Charles F. Haanel, Eckhart Tolle, Lynne McTaggart, Max Planck), and does provide clear guidelines toward achieving personal desires. Those who haven’t already read books touting the “law of attraction,” such as The Secret, will find useful information here.